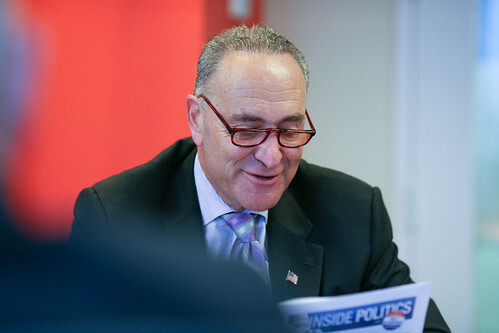 Never let it be said that Sen. Charles Schumer (D., N.Y.) isn’t an optimist. On Wednesday, the senior Democrat said that if his party was able to knock off one or two Republican-controlled Senate seats in next November’s elections, it would be “almost impossible” for the Democrats to lose control of the Senate. Mr. Schumer’s reasoning goes against the views of political oddsmakers, who think Democrats will have a difficult time retaining control of the Senate. They currently have a 53-47 majority, but 23 seats currently held by Democrats are up next year as opposed to just 10 seats for the GOP, leaving Democrats defending more than double the number of seats as Republicans. Analysts also believe about 10 of the Democratic seats are competitive, while just two of the Republican seats are seen as being potentially vulnerable. But Mr. Schumer sees it differently. He said it was possible Democrats can defeat GOP incumbent Sen. Scott Brown in Massachusetts, where former Harvard professor Elizabeth Warren is running against him. He also mentioned Arizona, Indiana and Nevada as possible Democratic targets depending on the candidates. The New York Democrat is far from being a novice in political matters. He ran the campaign which steers funds to Senate candidates in the fat years for Democrats in 2006 and 2008 when they regained control of the chamber and then reached their height of power at 60 seats, a mark that effectively gave them complete control of the Senate.